Before running a Cashflow Forecast or Balance Sheet Forecast it is important to ensure you have met certain prerequisite criteria in order to achieve an accurate forecast. Inaccurate budgets or cashflow settings will result in an inaccurate forecast. The purpose of this support note is to outline the default account, cashflow settings and budget requirements for an accurate Cashflow or Balance Sheet Forecast. If you're using the Calxa Online browser app, refer to these articles instead: GST/VAT, Wages & PAYG, Bank & Trade Accounts, Superannuation (Pension Plan), Depreciation, Inventory, Company Tax. There are some accounts which are critical for calculating the cashflow forecast, such as the main bank accounts, retained earnings, current year earnings, GST, Super accounts and many more. Some of these can be accurately obtained from your accounting file when creating or updating your organisation data while others cannot. The default account settings allow you to nominate these accounts and select payment schedules and rates where appropriate. Make adjustments in each of the categories General, Bank, Trade Debtors, Trade Creditors, Superannuation Payable, Superannuation Expenses and Wages (shown below). Use the drop down menus, radio buttons or text fields to apply the correct settings. The Paid account and Collected account are used for calculating tax collected and tax paid, select the appropriate liability accounts. Also select the Schedule and Calculation type that is used to pay your GST. See the Cashflow Schedules section below for descriptions of the default schedules and how to create a custom schedule. The PAYG withholding account is used for calculating the amount of withholding for wages tax. Select the appropriate liability account and Schedule that is used to pay your PAYG. The PAYG instalment account is used for calculating the amount of business tax payable. If applicable select the appropriate account and schedule that is used to pay your instalments. Please also specify the appropriate tax rate. This rate will be used to forecast the tax in your cashflow. Please specify the retained earnings and current year earnings accounts. Please nominate all bank accounts that you would like to include in the cashflow calculations. Calxa is unable to determine which bank accounts will be used for which transaction, therefore for cashflow purchases multiple accounts will be treated as a combined virtual account. This means if you would like your bank balance to reflect your combined bank balances, nominate all appropriate accounts. Please nominate all Trade Debtor accounts and Trade Creditor accounts. Multiple accounts will also be treated as a combined virtual account. To nominate an account click on the account in the Available Accounts list and click Add. To remove a nominated account click on the account in the Nominated Accounts list and click Remove. Calxa will calculate your superannuation payable liability based on your superannuation expense budget. Once again multiple accounts will be handled as a combined virtual account. Please nominate all super payable accounts as per the previous section and select the schedule under Superannuation Payable that is used to pay employee superannuation. See the Cashflow Schedules section below for descriptions of the default schedules and how to create a custom schedule. If multiple accounts are used with varying schedules then select the expense accounts and liability accounts with the most common schedule. Calxa will calculate the liability budgets for the accounts selected and manual budgets will be required for the remaining accounts. See the Budget Requirements section. The wages accounts will be used to calculate your PAYG withholding liability. The sum of all nominated wages accounts and the Wages Tax value will be used to create the PAYG withholding budget. Please nominate all wages accounts and set the Wages Tax amount. By default Calxa sets the Wages Tax amount to 25%. For best results you should take an annual average of your wages tax and set the value accordingly. If multiple wages accounts are used and you would prefer to set separate tax rates for each account you may exclude them from the nominated accounts and manually set the Cashflow Type in Cashflow Settings. If you're using the Calxa Online browser app, refer to the Cashflow (Basic Settings) and Cashflow (Advanced Settings) help notes. Please note: With the exception of Tax Codes, this section is intended only for Calxa Premier users. The cashflow settings screen lists your chart of accounts except those selected in Default Accounts. Each account has a default cashflow type and default tax code. In some cases it will be necessary to edit the default settings. Follow the steps listed below to edit these settings with details explained in two sections below called Cashflow Type and Default Tax. Select the Organisation from the drop down for which you would like to review the cashflow settings. 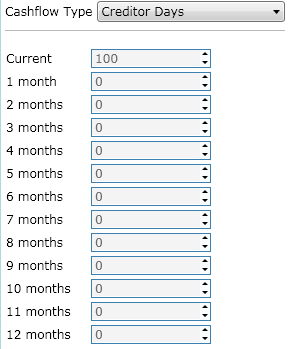 Select the account you wish to edit from the account list. 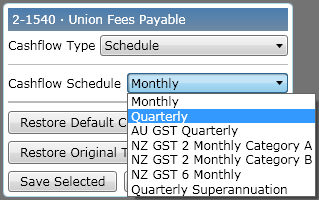 Select a cashflow type from the drop down menu in the right panel. Note - See the following sections for descriptions of each cashflow type – None, Profile, Schedule, Debtor Days, Creditor Days and Wages Tax. You may add notes to indicate why these changes have been made. When you have finished editing the accounts cashflow type, click Save Selected or click Cancel Selected to cancel the changes. Note - You may also restore an individual account's default settings using the restore options. Only the selected account will be restored to default settings. Alternatively you may make changes to multiple accounts and then click Save All to save all changes. At any time you may reset all accounts to their default Cashflow Type by clicking Restore Default Cashflows. Each account has a default cashflow type however in some circumstances it is required to have custom cashflow types. A description of each cashflow type and their use is outlined below. The cashflow effect of either income received in advance or prepaid expenses may require special consideration. For details on handling income in advance or prepaid expense please review the help note - Handling Income Received in Advance. This help note covers the specific example of grants received in advance however the accounting concepts remain the same for other possibilities. A cashflow type of none indicates that any budget in these accounts will not affect your bank balance. An example of an account that may be set to none is a depreciation expense. This is an expense that you may budget for however there is no cashflow effect from this budget. When budgeting on accounts with a cashflow type of none, special consideration should be given to balancing your budget. For details please see the Budget Requirements section. 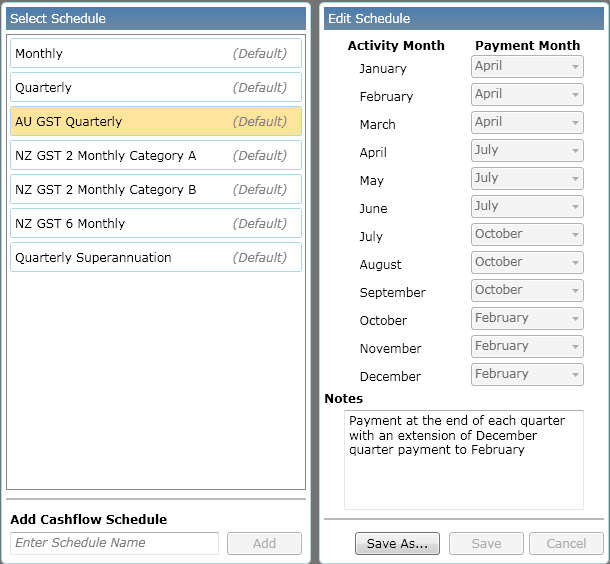 A cashflow type of profile allows you to set custom cashflow behaviour. For example if you invoice a customer and receive some payment upfront while the remainder is paid on delivery in two months’ time. 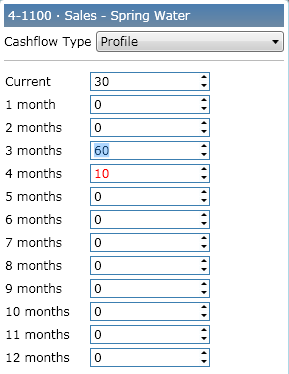 Any profile within a twelve month period can be achieved with this cashflow setting. With Profile selected as the Cashflow Type, adjust the monthly values as required. The values represent a percentage; therefore the total must equal 100%. Calxa will ensure this total is achieved by automatically adjusting other months accordingly. Automatic adjustments are highlighted in red. The above example would indicate the receipt of payment on this income account would be 30% upfront with a further 60% in 3 months and the remainder the following month. The schedule cashflow type is only available for Balance Sheet accounts. 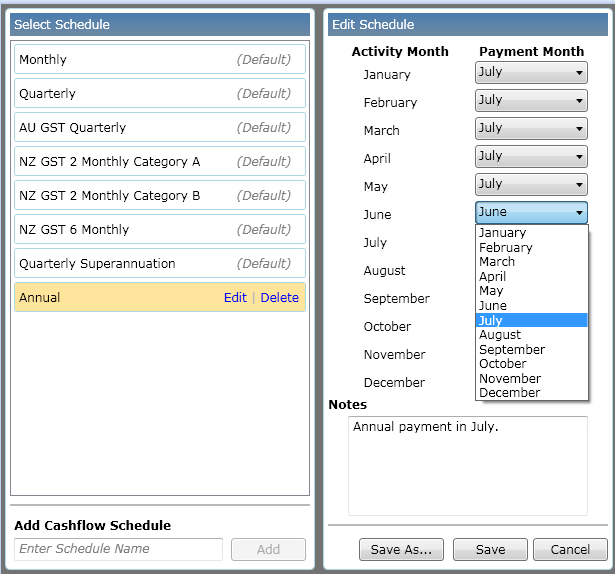 The schedule cashflow type can be used to reflect scheduled payments. For example, assume you have a quarterly payment for an expense; however you accrue this expense monthly to your P&L. In this scenario you would set the expense accounts cashflow type to none and the accrued liability account to the quarterly schedule. As mentioned with a cashflow type of none, you should also give special consideration to your budgeting requirements with the schedule cashflow type. For details please see the Budget Requirements section. To set the cashflow schedule select Schedule as the Cashflow Type and then select the appropriate schedule from the drop down. See the Cashflow Schedules section for descriptions of the default schedules and how to create a custom schedule. The above example shows a debtor days profile of approx. 40 days. This indicates that you could expect most receipts for payment the month after invoicing. Note - If there is insufficient historical data then the calculated profile may be unrealistic. In this circumstance there is an option to manually set debtor days in report criteria common settings. As per the debtor days cashflow type, this is an automatically calculated profile. Calxa will calculate your creditor days based on your outstanding debtor balance and the total expenses for the previous twelve months. These calculations provide a profile of how you would be expected to make payments on average. The calculated profile is displayed however not editable. The above example shows a creditor days profile of approx. 10 days. This indicates that all bills are expected to be paid in the current month. Note - If there is insufficient historical data then the calculated profile may be unrealistic. In this circumstance there is an option to manually set creditor days in report criteria common settings. If you would like to individually set wages accounts that were not nominated in default accounts you may use this cashflow type. Calxa will calculate PAYG withholding on this account. 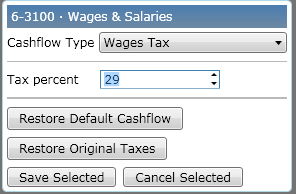 Select Wages Tax as the Cashflow Type and set the Tax percent. These setting help Calxa to determine if tax calculations are required on the associated account for cashflow or balance sheet forecasting. Depending on the accounting package you use, Calxa will apply these tax settings as per your accounting data. To edit the settings click the drop down menu in the Default Tax column of the account you wish to edit and select the appropriate tax setting. The budget is the single most important aspect of preparing a cashflow. To create an accurate cashflow you require an accurate budget. The minimum requirement is to have a P&L budget. This section will describe what is required in your budget however, will not describe how to create your budget. For help with creating budgets please see the following help notes - Using the Calxa Budget Factory and Create or Edit Budgets. The intention of your P&L budget should be to create a reasonable estimate of what will happen in your business. You may therefore be able to use the budget factory or budget short cuts explained in the support notes mentioned above to help create your budget. When calculating your Cashflow Forecast, Calxa will use your Default Accounts and Cashflow Settings to project the cash and balance sheet movements of your budgeted P&L. Since GST Collected and Paid movement is calculated all budget values should be exclusive of GST. If you do require a Balance Sheet budget, it is important to understand that the budget values reflect movement in that period. A value in a specific period does not reflect the balance in that period. The edit budget grid has the option to include opening and closing balances. The closing balance will equal the opening balance plus the sum of the movements in all twelve periods. Since the default cashflow setting for an Asset or Liability is a profile of 100% current, the effect of budgeting on the balance sheet is generally a direct relationship with the bank balance. If this is not your intention for a balance sheet budget line then ensure the appropriate cashflow setting is applied. Accounting rules dictate that debits must equal credits and the same can be said for your budget. Thankfully in most cases Calxa will keep your debits and credits balanced for you, however there are certain circumstance when this is not possible. Namely when budgeting on accounts with a cashflow type of none or schedule excluding nominated default accounts. In the cashflow setting section we used the example of depreciation. A depreciation expense does not have an effect on you bank balance and therefore you should set the cashflow type to none. In this example Calxa cannot determine the Asset account to depreciate so this must be handled manually with a corresponding contra Asset budget and setting the Assets cashflow type to none. Whatever the reasoning, the important thing to note is if your budget on accounts with a cashflow type of none or schedule, then you must ensure the budget is balanced. The Discrepancy Analysis report will check the balance of your budget. This report will isolate the accounts of interest and their associated budgets to help resolve any balancing discrepancies. For more information on this report refer to the help note – Balancing your Budget with the Discrepancy Analysis Report. Calxa has a number of default Cashflow Schedules. To view or edit these schedules click Cashflow Schedules. All available schedules are listed in the left column, with details and notes on individual schedules are in the right column. Select the schedule from the left to view the details of a specific schedule. 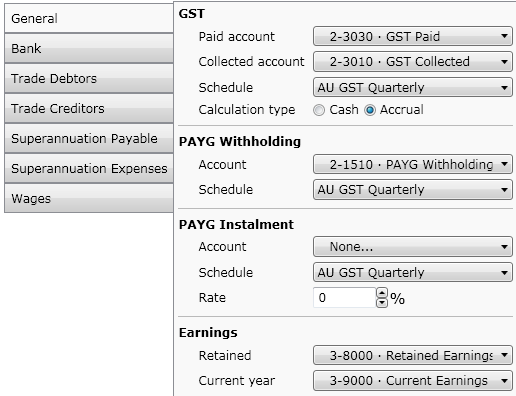 In the example below you can see that AU GST Quarterly is selected. In the notes field you can see the description of this schedule, “Payments at the end of each quarter with an extension of December quarter payment to February”. As the description suggests, you can see that the January-March quarter has the payment in the following month of April while the October-December quarter has the payment month not in January, but February. You may review the other schedule details in the same way. To create a custom schedule you may either click the Save As… button to start with a copy of an existing schedule or type a name in the Add Cashflow Schedule field and click Add to start with a current month schedule. 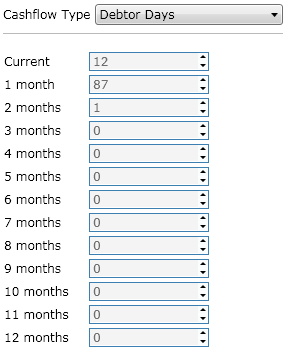 Make the required changes to the payment month and click Save to save your changes.